Today, some of the highest rates of maternal death occur in Assam, India, where indigenous and low-caste workers on tea gardens lack basic healthcare, housing, and nutrition despite domestic and international laws mandating full protection. Women in these communities have insufficient access to essential healthcare services and minimal exposure to legal resources that would inform them of their rights. Due to their devastatingly low agency and awareness of their rights, female tea garden workers in Assam suffer from the highest rate of preventable maternal mortality and infant mortality in all of India. To address these gaps, ICAAD is working with Nazdeek and PAJHRA and local activists in Assam to combine community mobilization and technology with legal intervention to increase access and accountability in the delivery of reproductive health services, thereby reducing the number of preventable maternal deaths and increasing access to lifesaving medical treatment. Tea garden workers earn the lowest wage in the organized sector in India and suffer from shockingly high malnutrition and anemia. 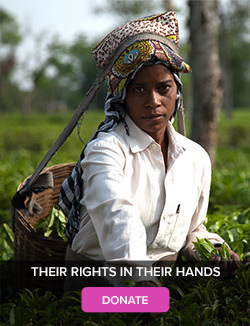 Additionally, tea garden workers have insufficient access to health facilities and essential services. Existing facilities are severely underequipped and understaffed, and many villages are located in underserved and remote areas. As a result, Assam has the highest maternal mortality rate in India and families have minimal access to legal resources to seek redress. According Mousumi Gogoi, a scholar at the International Institute for Population Sciences, Assam has a maternal mortality rate of 390 per 100,000 live births compared to 221 for the rest of India. The Supreme Court of India has recognized the right to health as a fundamental right, and various High Courts have held that maternal mortality is a human rights violation. The Central Government and the State of Assam have enacted a series of policies to curb maternal and infant mortality rates and guarantee universal health care, however, extremely limited awareness of government policies among communities combined with a lack of monitoring and weak community engagement has resulted in gross failures to implement policies that ensure access to basic health entitlements for Adivasi women. The existing monitoring system is inefficient and unaccountable, and community members unaware of their entitlements. Nazdeek, ICAAD and PAJHRA are combining community trainings, technology and legal intervention to increase accountability in the delivery of maternal health services in Assam. 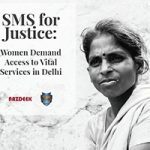 Using SMS-based technology, 44 women activists, many who are women living in the tea gardens, are identifying and reporting maternal health rights violations in tea garden and public health facilities. 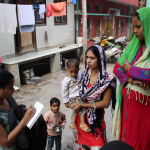 The women activists are also documenting the delivery of food benefits, crucial for pregnant women and their families, through the Public Distribution System and the Government’s Anganwadi Centres. The project is monitoring service delivery in 16 health facilities across two blocks in Sonitpur District, Assam. The project relies on open source technology offered by Ushahidi. The information received is subsequently verified and collected on this online platform to map the areas of concern and patterns of violations. The data collected will provide local activists and lawyers with ground data necessary to combat maternal mortality and save mothers’ lives. Go to www.EndMMNow.org to view the reports. Nazdeek is a legal capacity building organization committed to bring access to justice closer to marginalized communities in India. 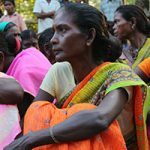 Nazdeek partners with grassroots activists and lawyers to build community-based legal networks to increase accountability in the protection of social and economic rights. EndMMnow was initially supported by the Information Society Innovation Fund (ISIF), Asia.